This book contains the original version of The Legend of the Christmas Prayer plus two other Christmas stories by Brian Morgan, plus thoughts and aspirations by some of the world’s most endearing minds. We will post reviews of The True Christmas Spirit as they are received. In the meantime, reviews and comments on the now out-of-print book follow below. As new reviews arrive, they will be posted above the older reviews. This book is a Christmas gift – scanned through it, and it looks great. This book is a Christmas gift, therefore, I haven’t read it myself. However, if it is anything like “The Legend of the Christmas Prayer”, I believe it is a wonderful book. Have the original hardback of “The Legend of the Christmas Prayer” by Morgan. Wanted to buy it for friends but it wasn’t available. Found this paperback and gave it as a gift to several friends. It was appreciated by all recipients. 5.0 out of 5 stars Great book as a reminder that love is the reason for the season. I gave it to all my immediate family for Christmas this year. I hope they read it every year to their children & share it with friends. Thank you for filling a need for me so beautifully! This is such a gorgeous book! Brian Morgan is to be congratulated on a very inspiring and reassuring read. Your book is really inspiring. I’m sharing it with friends. The True Christmas Spirit: Let Peace and Joy Fill Your Heart is a fantastic book. The True Christmas Spirit is such a lovely gift. We will be sharing it next Christmas. Thank you for the gift of The True Christmas Spirit. I plan to read it again after the frantic Christmas rush is over. Love The True Christmas Spirit. We’ll read it again when we get to the farm after Christmas. Thank you for the inspiration. What a lovely Christmas book! It’s very inspirational. Like to return from The True Christmas Spirit to the Published Books page? I want to thank you for the present of The Legend of the Christmas Prayer. I believe it has excellent commercial value. We all took turns reading a section at Christmas Eve, where we had 20 members of the family present in California. Everyone was impressed and moved. A beautiful and unique Christmas book with a beautiful message and wonderful potential. I wanted to let you know that our first print run is now at 100,000 and rising. This is absolutely astounding for a first print run from an unknown author here! God definitely has His hand on that little book. We owe immense thanks to you for writing this wonderful little book. People keep falling in love with it. You have been a most agreeable author (the kind we especially like, by the way). This is a rare book that’s destined to be a classic. The Legend of the Christmas Prayer is surely one of the finest little gems in Christian literature. It will give your loved ones not just a token of your love at Christmas, but something to carry them through the year. For each of the twelve days of Christmas, it offers readers a priceless, intangible gift. I really loved the book and the artwork. It is truly unique and will touch readers everywhere. Christmas has become so materialistic it’s sad. It’s nice to see something like this to remind us that it’s not the “things” we give that are important. This is a beautiful book, a beautiful story. It will resonate with our Decision Today Radio audiences really well. Your reading of The Legend of the Christmas Prayer is major news here and wonderful for us all. It has been aired on Billy Graham’s radio program, which reaches millions all over the world. I am so pleased that you seized this sensational opportunity. Many congratulations on your success. I have always loved this book. Your story is so meaningful, so inspired. Both your reading of The Legend of the Christmas Prayer and our interview sounded wonderful. We are being swamped with calls. We are getting letters from folks using your book at Christmas parties, programs at schools and churches etc. They all say such wonderful things about the book. Congratulations to you on the success of The Legend of the Christmas Prayer. I’m not at all surprised to hear it did so well on the CBA bestseller list – I knew it would. I’m sure the little masterpiece will find readers for many years to come. I enjoyed working with you. Your book did great success last year at Christmas and will have another round of success this year  in Hallmark stores as their premier Christmas title. The book is also in Lifeway, a large chain of Christian bookstores, and is promoted in their Christmas catalogue – so we will see more sales this year. It is also, of course, on the Thomas Nelson Christmas display, which will be up in many stores. As you know, your book, The Legend of the Christmas Prayer, has been licensed for foreign editions. Enclosed are copies of the finished Japanese edition. Thank you for the opportunity to represent your work and make quality publications available around the world. Every Christmas, I try to find a book that will reflect the true meaning of the holiday spirit. Well, I found it in Mr. Morgan’s book. In this world of trying to find the perfect gifts, we learn that the perfect gifts are those within us. Beautifully written and illustrated, the book is an easy read and a wonderful way to spread the true meaning of Christmas. I bought this book, read through it, and went and bought 5 more for presents. It’s a perfect gift. I found the text to really reflect the real meaning of Christmas. The “wishes” in it were exactly what I’d wish for everyone on my Christmas list. I might even give 2 to each person, with the instructions to pass the second one on. This book should be sweeping our country this Christmas. This beautifully written and illustrated little book is the perfect Christmas gift for yourself and those who matter to you. I bought one for myself and one for each of my children and we consider these family heirlooms to treasure and share every Christmas. This book is absolutely wonderful. Very heart-warming and it brings back the true meaning of the season. My wonderful wife Evelyn called to my attention a tiny book written by Brian Morgan entitled “The Legend of the Christmas Prayer.” This tiny book edifies everyone. This will life YOUR heart. I, too, have just been introduced to this wonderful little book. I love it so much, I’d like to give some away, but so far, I’ve been unable to find any affordable copies. May I ask where you got yours? If you know where I can find them, please let me know. Thanks so much, and Merry Christmas to you and yours. This is a beautifully written prayer disguised as a very short story. It only took ten minutes (or less) to read, but longer to reflect. This prayer will stay with me for a very long time. It’s one I will read over again and again. Yes, I would recommend this product to a friend. I always keep an eye out for this beautiful little book on ebay. I received my one as a Christmas gift when it was 1st published & I hunt them down each year to give to others at Christmas. They are no longer in print, but worth hunting for. Heart-warming message from Australian author, Brian Morgan, about the true meaning of Christmas with bible quotes and gorgeous illustrations. Well presented, hard back with gold cover. I bought one of these for my husband and it was so touching for both of us that I bought another for my dad, who is also the epitomy of the idea presented in the book. The art is excellent, the story unfolds throughout on a parchment scroll depicted on the pages with artwork that is very real and draws you into the thoughts presented. It is a truly unique approach to the Christmas season in our world today and it brings the true meaning to the surface in such a memorable way that you will be so glad to own this book for years to come. We plan to make it the central part of our traditional Christmas celebration from now on to keep the real meaning of the holiday uppermost in our hearts and minds. I highly recommend you share this with those you love. It’s a beautiful book inside and out. My Mother-in-law said this is one of the best books she has read. It is very short but hits home for those who take time to read it. It was different than what I originally thought I was getting. I read the book and loved it. It helps people put life back to the way we all should be thinking all year. It will be a book that gets placed on the coffee table every Christmas season if not all year. I would recommend it. I just thought it would be a good story book. I enjoy purchasing on line because it allows me to shop from my desk… This specific book I share each year at Christmas with family and close friends because it “says” so much. If you have read The Legend of the Christmas Prayer and would like to add your thoughts, please use the email address below, or post your thoughts elsewhere on the Internet. Brian Morgan very much appreciatse comments on his work. His books are only available online now, so your comments very much help him spread the word. 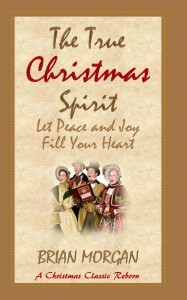 The rights to this book have reverted to Brian Morgan at his request and, in 2013, The Writers Trust published the original version of this book in the book titled The True Christmas Spirit: Let Peace and Joy Fill Your Heart.